In response to some discussions around models for the delivery of non-accredited training along side nationally accredited training and why L&D departments choose non-accredited training over accredited I thought that I might pull some of the threads of posts and bits and pieces together so that they were all in one place. Australia has one of the best Vocational education systems in the world. It is well generally well respected and provides both individuals and organisation with nationally accredited outcomes and qualifications, which are transportable across industry and provide a mark of competence against a defined set of criteria. So why then do organisations make choices like these? $250,000 for the C.A.R.E program as opposed to a Certificate IV in Child, Youth and Family Intervention. This paper will look at the reasons behind the choices that are made by Learning and Development professionals working in organisation, the drivers and considerations and how that effects the usage of the Australian Vocational education system. It will also consider the drivers from the VET sector, both at strategic and coal face levels that tend to perpetuate and reinforce the decisions made by organisations. The disconnection between these two sides of the equation will be evaluated and model developed which can assist both organisations and training providers to be better able to communicate and meet learning needs, both at an organisational and individual level. In order to do this it will be first necessary to look at what motivate the purchasing decisions of organisations with respect to training. What causes an organisation to choose one learning program over another, this is of particular interest when the price points of the various learning programs in question are often very similar. In addition to the choice of program there will also be a discussion around the choosing of providers for the delivery of learning programs and how the choice of provider can affect the purchasing decision. The purpose of training from both the organisation and the individual will also need to be considered. Once the organisational side of the equation has been considered we will move to the provider or VET side and consider both the strategic and coal face positioning which tend to put the VET sector at odds with the need of industry and organisations. In order to do this there will need to be a consideration of what is the purpose of training from the point of view of the VET sector and the business and funding models which have been adopted in the sector as this it will be seen, is one of the key issues in translating VET training into organisational learning. In addition issues around the pricing of programs, delivery methods, facilitator qualifications and experience, reputation and brand will also be considered as again all of these have the effect of creating a disconnection between needs of the organisation and VET sector. With the disconnection considered and understood and the issues which cause it out in the open, the discussion can move to looking at a range of strategies, particularly from the Training organisation side of the equation which can assist to overcome this disconnection. 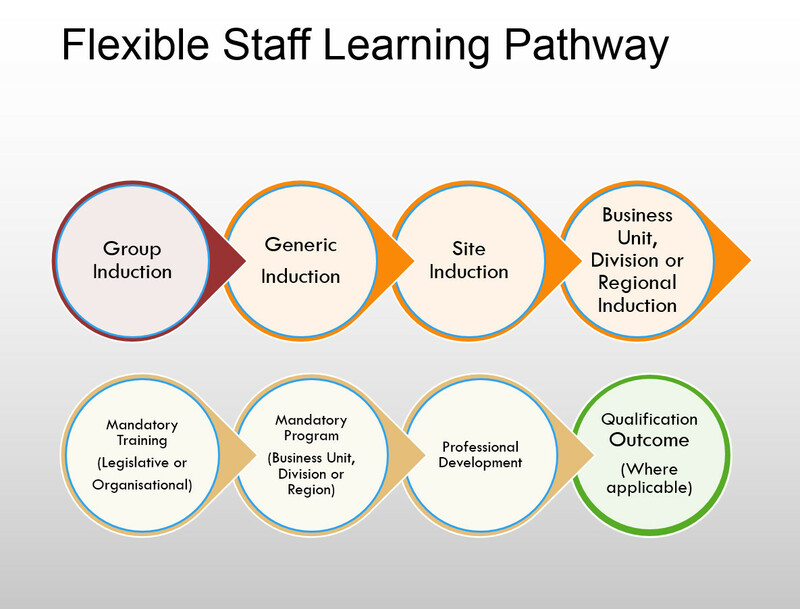 There will also be a limited discussion as to what could be done on the L&D side to assist in overcoming this disconnection, but as we will see this is a problem which is best address at the VET sector side of the equation as they possess a level of flexibility (even if they don’t know it) which can easily navigate creating a better connection. Once all of this has been discussed a model will be presented which can assist all of the stakeholders involved in the process to better understand the part they play and to provide a framework upon which to build their own unique structures. Organisational learning is an unwieldy beast at the best of times and the Learning and Development professionals who attempt to herd this group of cats are always looking for ways to meet the needs of the both the organisation and its staff. So let us go back to the initial question that I posed right at the start. Given that Australia has a robust and well respected vocational education system, why then do organisations make choices like these? If we consider the first example, why would an individual or an organisation choose to spend the same amount of money on a program that in its own words, simply provides a methodology for project management over a course which would provide them with the actual skills and knowledge needed to run a project? In example two, why would an organisation spend a large sum of money of training that has been developed in another country, does not have rigorous assessment and competency standards attached to it and while used widely, is not considered to be the industry standard, rather it is just one model amongst a number of models and offers staff little transference of skills should they move to another organisation which does not utilise that model? There is as would be expected not a single answer or factor that is behind choices like these however there are a number of commonalities which we can consider and address in order to ensure the best possible chance of connection between the two sectors. The first and probably the most obvious reason or factor present in decisions like these, relates to timeframes. Most L&D departments are under pressure to deliver programs in quite short timeframes, (Can I have that as a half day?) which I have explored in other works. There is almost always a pressure from the business to ensure that staff are not taken ‘off the job’ for more time than is actually necessary. In this way a program that runs for five consecutive days and then is finished may be preferable to a program that runs for 6-12 months even if it only runs one day a month. The logistics around making staff available are easier for one off programs. In a lot of cases particularly where the person is in direct client facing roles, other staff have to be moved around or rostered in order to allow for a staff member to go on a training course. It is also often the case with VET training that there will be work that the staff member is required after the delivery of the program itself to meet the assessment criteria of the program. This then in a significant number of cases leads to the staff member applying to have some of their work time allocated to completing their study which in turn puts addition time and resource pressure on the business manager. The other time related factor which often comes into play here as well is that of the time commitment necessary from any managers, supervisors or team leaders involved with the staff who are undergoing training. With most professional development programs as opposed to national accredited programs there is little or no involvement needed from the supervisory staff of those undertaking training. However this is in most cases not the same situation when we look at VET training. There is almost always in the case of VET training a requirement of ‘on the job’ observation or training which needs to be undertaken with the staff members in question. This is often further exacerbated where the manager or supervisors are not in the same workplace as the staff requiring supervision and observation and by the by the fact that often these activities have to happen on more than one occasion for each participant. There is also the issue of the time involved for the individual L&D staff members, with professional development style programs there is often not a lot of additional work which they are required to undertake. Again this is often not the case with VET training, in particular where the training program being delivered is not simply a generic program. There is time spent consulting with the RTO around the content of the program, looking at what needs to contextualised to the particular business unit or units who are being trained, signing off on paperwork, which it of particular relevance where VET training is being delivered through a funding or subsidy program such as an apprenticeship or traineeship scheme. Even if we just consider the issue of time it can be seen why a lot of organisations and L&D units would opt for short course professional development style programs, where the time and resource costs are quite low over nationally accredited training. Learning and Development staff are often asked by the business what the Return on Investment (ROI) was for training that was delivered, either in terms of particular programs or as whole. Unfortunately one of the things that RTO’s in general do not do particularly well, and we even see this at a national level is terms of the kinds of data that is collected, is evaluate their training well. In fact it seems that the data that is often collected is often not the data that organisations are even interested in. We find that completion rates data is collected almost all of the time, yet only 33% of organisations view it as being valuable data. Yet we see that data around job and business impact is rarely collected but is rated as extremely valuable by organisations. Often training providers in the professional development market have developed systems to make it as easy as possible for them to collect the kinds of data that organisations view as valuable and have large stores of this data which they can utilise to be able to show that there are (or appear to be) very solid business reasons in terms of ROI and other measures for an organisation to invest in their training programs. When the collected by most RTO’s or even by the government through agencies such as NCVER is put against this data it is lacking and does not offer a compelling case for and organisation to choose VET training over professional development training. The issue of data is one that also ties into another big issue which is that of brand and reputation. If we consider Prince2 training, why would an organisation or an individual choose to spend $3000 on a Prince2 course when they could spend the same amount and get a certificate IV or even a diploma of project management through the Australian VET system? One of the most powerful and significant reasons behind this choice is BRAND. Prince2 is a powerful brand, it is an internationally recognised and accepted certification of knowledge of the Prince2 project management methodology. It is a ‘requirement’ for employment in an ever-increasing range of government and public service positions, as well as in the private sector, so strong in fact is the brand that often experienced project managers with degree level study in the field, find it difficult to obtain roles without it. When we consider the Brand strength of VET against this background again it can be seen why organisation and individuals would choose Prince2 over VET. Now while it may be true that the brand strength of individual providers or particular programs could be quite high, when faced with an initial choice about which program to choose the overall strength of the Prince2 brand overshadows the strength of the overall VET brand. Add to this the issue that a lot of people in organisations and even in L&D departments do not understand the VET sector and how it works and are often confused by the rules and regulation, the choice seems even easier to make. Given that L&D departments, even very large ones, are often both resource and finance poor in relative terms, one might think that offering a government subsidised training program or a program that came with financial incentives for the organisation itself, may well swing the pendulum back to the RTO side of the equation. Unfortunately there are a number of reasons why this is not the case. One of these is of course perception of value. If something if free, incentivized or subsidised then there is always the possibility of it being seen as being less valuable, though of course this is not always the case. This however is not the main reason here, the main problem is that of business or organizational fit and need. When I was running an L&D department responsible for the delivery of training to more than 35,000 staff, it was not uncommon for me to receive between 3 and 10 phone calls a week from training providers, both RTO’s and not. The difference between the two groups approach was very stark, in most cases the RTO lead with words around free training, government subsidies, and incentives for the organisation, essentially they were selling the money. They were wanting me to buy the programs that they were funded to deliver now there is nothing wrong with that at all, except I was necessarily interested in putting staff through a whole Diploma of Management when all they really needed was a course on communications skills. Now the approach from the other training organisations was more often than not the exact opposite. They asked me what it was that our staff needed, what was the biggest issue we had and questions like that. Also where they couldn’t meet the need that we had, they would point us in the direction of someone else who could rather than attempting to fix us into the box that they had already drawn. The point is that for organisations in particular and even for a significant number of individuals it is about business need, it is about the skills and knowledge they require, it is not about the qualification. Also and this is very much and organizational mindset but it also applies to individuals as well, they would rather spend the money to get exactly what they want, rather than get something that is not exactly what they want but is free. When we take all of these issues, in conjunction with the perception that VET programs are difficult at access administer and manage (whether it is true or not) it is easy to see why both organisations and individuals might choose non-accredited professional development programs. So given all of the issues above why would an organisation choose to send its staff to a nationally accredited VET programs, what would prompt someone to choose a certificate IV in project management over a Prince2 Foundation program. The answers are as you would expect fairly straightforward. One of the most significant reasons for organisations choosing to have their staff undertake VET programs is the robustness of the system, particularly in terms of assessment of competence. Unlike the vast majority of professional development programs which staff attend, accredited training has actual assessment which the student is required to undertake, which are then marked against standardised criteria to determine that persons competence. This is particularly attractive to organisations who work in areas which could be considered to be high risk or where parts of the business deal in high risk areas. Should something tragic occur within an organisation which results in the serious injury or death and the organisation needs to testify about the competence of its staff, being able to say that staff had undertaken nationally accredited and been deemed competent, is far more potent than saying that they attended a 2 day course with no assessment of competence. Probably the next most significant reason for choosing a VET program is reputation, not the reputation of the VET brand in general, although the stronger the general VET brand is the better, but the reputation of the individual RTO and its relationship with the organisation. Most managers and organisations and even L&D specialists have very little idea of who provides good training by just looking at a website, talking to a sales person, looking at government statistics or reading a brochure. It is all really the same at that level there is no difference and everyone can claim to be the best at what they do. If I had a dollar for every time someone had sent me an email or pick up the phone and asked me “So is this training course any good?” I would be a far richer man than I am. Now if the program costs $50-$100, it’s a half a day and only one person is going the risk is not too great. You could even use them as a test case, to evaluate the program and report back. However, what it the training is $3000 per person or 250 staff want to do it. That changes the ball game very rapidly, and as the spend goes from thousands to tens of thousands and sometimes even beyond the need for there to be something, other than just a certificate (even a nationally accredited one) becomes more and more important. This is why reputation in the marketplace, connection and networks are so vitally important. If you are just one of five people who rang the L&D person this week offering them free management training, there has got to be something that is going to separate you from the rest. If there isn’t you are not going to get past the first phone call. Part of building that reputation or making yourself stand out and be different is to do the other things that L&D people, managers and organisations want you to be able to do. Let’s look at customisation first. A lot of the training providers talk endlessly about their ability to customise a program to meet the needs of an organisation. How many of them actually do, I think unfortunately, or fortunately for those who do, not many. Often customisation means nothing more than choosing different electives, although not too different or there might not be someone able to train them. Just changing electives however is not customisation, customisation is building the training program in such a way that it achieves the goals that the organisation wants. It is about using their documents, their policies, their procedures. It is about building a program that produces a participant who has the skill set that the organisation requires and is able to utilise them. The complaint about this kind of customisation is that you still have to do what the training package says, they have to be assessed on the performance criteria. That is true, but I don’t think that anyone ever said that that was all a program had to contain. It doesn’t say anywhere in the packages that you cannot add additional information or assessment or training. What it say is that this set of skills and knowledge, assessed against this set of performance criteria is the evidence that is required to deem this person competent in this Unit of Competency. The other issue that is often bought up is where there is something in the performance criteria that for whatever reason the organisation doesn’t do or do completely differently. An example of this is a unit of competency around strength based practice in support work and counselling. There is a process mentioned in the performance criteria which while correct and used by a lot of practitioners, is probably not used, described differently, used differently, by equally many practitioners. So (leaving aside questions whether or not the criteria should actually even be in the unit) what does customisation look like here for an organisation that doesn’t use it as to meet the performance criteria you can’t leave it out. You simply do both and assess both, and tell the students that one is preferred method where they work now, but there are other organisations which prefer to use the other method. Is it a little more work? Yes, but it will also make the organisation much happier than saying well we have to teach them this method because that is what the training package says and then let them come up with a solution around how to train their staff in their preferred method. Customisation is actually an enormous strength within the VET system as opposed to many of the other proprietary training programs that are out there, most of which can’t be changed and customised to suit particular circumstance, because the material is copyrighted and licensed and often the people delivering the training have no say in the content because of this and in order to meet the criteria of the provider that owns the program they have to do things in a particular way, over a particular number of hours or days. Everything is tightly controlled. This should not be taken to mean that we can and should ignore the rules of the VET sector, things like Volume of Learning, rules relating to assessment and evidence, however the space circumscribed by those rules allows us much more latitude to be able to develop and deliver a program that meets the needs of our clients than most licensed training would ever be able to do. The other enormous strength of the VET system in Australia is its ability to integrate with what is already being delivered and done within an organisation as well as with training which comes from other sectors of the market, outside of VET. This is because for the most part the Australian VET system is content free, it does not worry where your knowledge comes from or how you acquire it, it is simply concerned with a student’s ability to meet the demands of the performance criteria. This makes it extremely flexible and able to integrate into a wide variety organisational training plans and structures. The concept of how integration works is quite simple. It relies however on combining what I said above, that it doesn’t matter to the VET system where you learnt something, just that you can show that you’re competent and the fact that L&D departments are going to run non-VET training for their staff. In fact in most organisations the amount of non-VET training which is run far outweighs the amount of accredited training that is delivered. So if we look again at the example of the community services organisation which is utilising an overseas training product to ensure their staff have the skills and knowledge that they feel they need to have. Now at a very basic level we can take the training product in question and whatever assessments form part of it (if any) and map this information across to for example a Diploma of Child, Youth and Family Intervention. Now certainly we may need to add additional assessment pieces, including things such as workplace observations in order to ensure that we have enough evidence of competence to meet the requirements of the training package. From there staff can go through the non-VET training just as they would have previously, undertake the additional assessment tasks which are necessary and any other work and assessment which may be necessary and then at the end of the process not only have they successfully completed the training the organisation requires, they have obtained a nationally accredited outcome from that training as well. This is of course a win from everyone who is involved in the process. The staff get a transportable, recognisable qualification, the organisation gets it staff trained in the program that they require and the RTO gets business that it would not have otherwise got. This concept of integration can be taken much further however. Rather than simply looking at the outcomes of any particular course or program we can look at the overall picture of training within the organisation and create a model of delivery which further improves the outcomes of process. So what is the model? Below is an example of how the concept can work within a community services organisation. So how does this all work? All staff at all levels of the organisation go through a standard general induction, the standard who we are and what we do style program. Once that is completed each business unit then has a separate induction program specific to their own needs and training requirements. A small number of Units of competency can be built in at this level, the completion of which along with the rest of the induction program can be linked to the probation periods and extensions. Once the induction training is completed there will be a set of training programs that everyone in the organisation will be expected to undertake, from generic programs like Fire safety and Workplace health and safety to more organisationally focussed program such as in this case, mental health awareness and strength based practice. Alongside this training there will also be business unit specific training which is also required, a disability support worker for example would need behavioural awareness training, and where as a senior manager might be put through a more rigorous financial accountability program. There will then be a range of programs delivered by and for the organisation which are available to all members of staff, these might be things like communication skills, crisis intervention skills, computer skills, and a range of other programs. Once staff have completed all of the mandatory programs (both generic and unit specific) they can then undertake any of the training available within any policy constraints put in place by the organisation. So all that has happened here is that the organisation and any associated training providers have simply delivered the training that they would have normally needed to deliver. However if the RTO (be it internal or external) has mapped all of the training being delivered and looked at the assessments and what gaps are needed to be filled in order to meet the requirements of training package, what has actually happened is that the staff member has progressed quite a long way towards a qualification. Now they may need to do some additional assessment work, on the job training or skills observations by their managers and supervisors, but they will, if they wish and this system seems to work best if it is voluntary for any extensions over what is mandatory, have accumulated a group of Units of competency. From here the staff member can sit down with the RTO, their manager and anyone else who may have relevant input look at the range of qualifications that the units they currently have could lead them to and what they need to do to achieve them. What this means for the staff member is that they may be able to achieve a number of qualifications, rather than just one, by doing a much smaller amount of additional work. This also provides both the organisation and the staff member with a little bit more flexibility in terms of talent and career development options as well. Someone who is moving towards a management track can be encouraged to take more management based units to fill out their qualification, rather than practice based units which might be more applicable for a frontline worker. Reduces the cost of delivery and the time off work costs associated with accredited training. A more generic example of the model can be seen below. Now admittedly in order to make this sort of model work effectively there needs to be very close collaboration between all of the stakeholders in the process, particularly the RTO and the L&D staff. 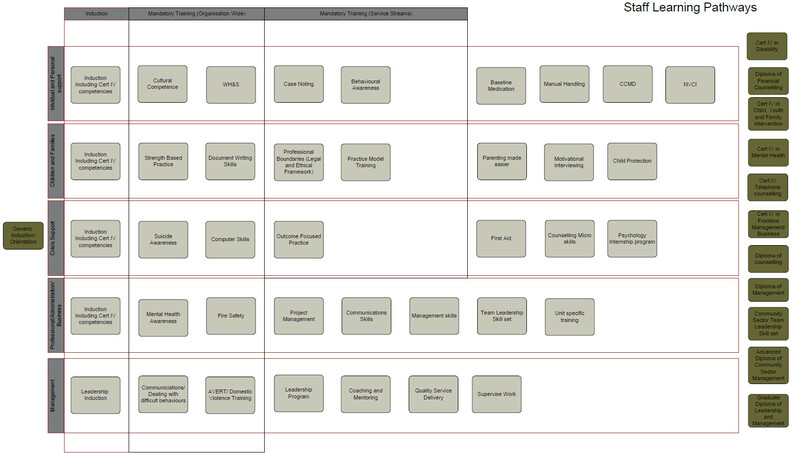 However, once implemented a system like this delivers a wide range of outcomes for everyone involved. The adoption of a system such as this allows for all of the training both informal and formal that is undertaken by staff and delivered by the organisation to be utilised towards a qualification or set of units of competency. Ask yourself this, ‘Are you just another provider delivering Management, Community Services, Hospitality, construction or some other set of qualifications? Are you actually doing something different or are your programs, approach, materials and delivery just the same as the RTO or TAFE down the road? If they are than you might have a problem. If your selling point is price, or that the training is free or heavily subsidised then you might have a problem as well, simply because you are not, in most cases the only choice out there that organisations have. What is it that you do that is actually different from the RTO down the road? What is it that you do exceptionally well? What are the Big, Brand Ready skills of your people? Providers also need to look at what they are ‘selling’ and how it is packaged. Are you the fifth person this week who is going to talk about the Diploma of Management, or the first person to talk about your customisable leadership and management development program? Here is an example of what the right branding and wording can do for a program. A few simple changes and a realignment of thinking took the program from one which had an intake of about 30 participants per year at about $695 per participant to one which enrolled 160 participants last year at an average price point of $3260 per participant. All of this because it was targeted at a perceived need for organisations rather than as simply an accredited program. 75% of our managers have completed a Certificate IV in Project Management. Good, so we have seen a reduction in cost overruns and are meeting project deadlines? So don’t start by telling L&D people what qualifications you offer or what subsidies are available, ask them instead what their biggest issue is right now and show them how you can solve it. However, there is an important addendum to this and that is if you can’t solve it and solve it well – tell them and walk away, unless you know someone else who you know can solve it. Remember if you hand them off to someone who you know and trust to help them, they will remember you both.